This breakout board easy to interface with any microcontroller and reverse polarity protection, easy to connect screw terminals. 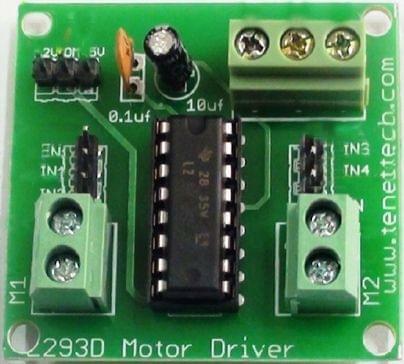 L293D contains two inbuilt H-bridge driver circuits. In its common mode of operation, two DC motors can be driven simultaneously, both in forward and reverse direction. The motor operations of two motors can be controlled by input logic at pins In1 & In2 and In3 & In4.